As a kind of traditional welding technology, wave soldering and reflow soldering play an active role in the field of electronic manufacturing in the assembling process of electronic products. The quality of welding is related to product performance, reliability, service life, etc., and will affect each subsequent process flow. 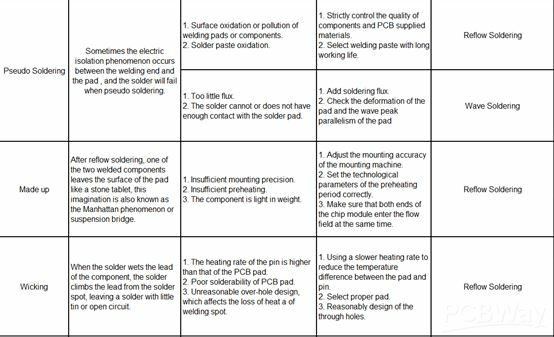 By analyzing and comparing the defects in the process of wave soldering and reflow welding from the quality control before welding, production process materials and process parameters, thus greatly improving the production process and quality of electronic products. 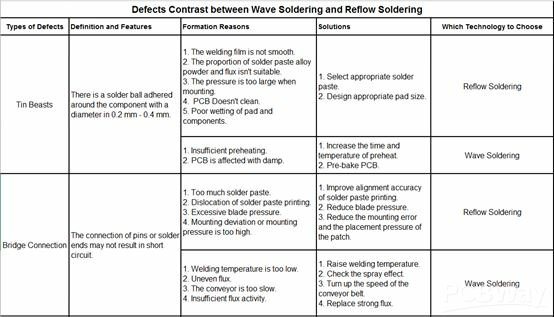 Wave soldering refers to the process of soldering all the welding spots on the printed circuit board inserted with the melted solder by wave soldering machine. Wave-peak welding has been used for PCB mounting for more than 20 years, and now has become a very mature electronic mounting technology, which is mainly used for the welding of through-hole mounting components and surface components adopting mixed assembly. 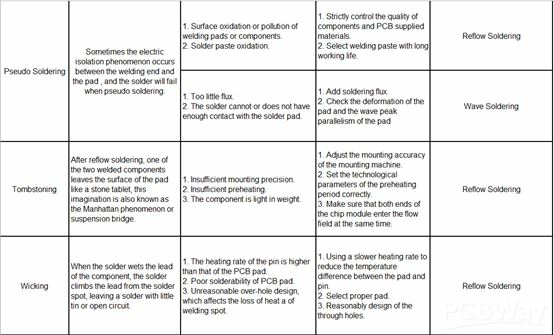 The technological process of wave soldering is: preparing before welding, applying flux, preheating, wave soldering, cooling and cleaning. Preparation before welding is mainly used to remove oil pollution, remove oxide film and coated solder. The next step is to apply a thin layer of flux evenly on the surface of the printed circuit board and the leading end of the components. After the surface of the printed circuit board is coated with flux, it is heated through the preheating zone at a certain speed. Preheating is to heat the PCB to activate the flux and reduce the thermal shock of the PCB in contact with tin wave. After the printed circuit board is coated with solder and preheated, the board surface of the printed circuit board is in contact with the solder wave crest when soldering, the welding part first contacts the first crest and then the second crest. The first wave crest improves welding reliability and the second wave crest ensures welding quality. 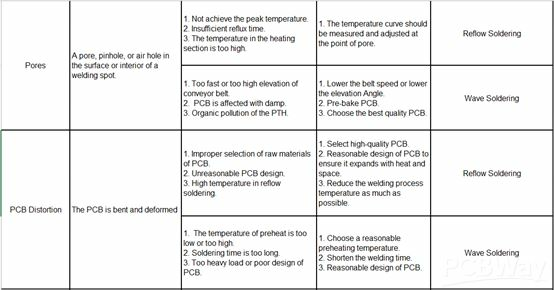 After the PCB welding, the board surface temperature is very high, and the welding point is in the state of semi-solidification. In order not to affect the welding quality and not damage the components, cooling treatment must be carried out after welding. After cooling treatment, the residual solder on the board surface is cleaned in time to make the board beautiful and have good electrical performance. Reflow soldering, also known as reflow welding, is mainly used for automatic welding of SMT components, which means that processing the welding flux into a certain size of granular or powder, mixed with appropriate adhesive, making it a certain liquid paste. Sticking the surface mounting components on the PCB by using welding flux, and then by heating welding, paste the welding flux to melt and flow again, which achieves the goal of components will be welded to the PCB. The technological process of reflow soldering technology are as follows: welding preparation (printing), pasting the welding flux and mounting the components, heating, and then flow to cooling to test, repair, washing and drying. Preparation before welding, like wave soldering, is used to remove oil from the printed board and remove oxide film. The next step is to apply the paste and attach the SMT components whose process can be done manually, semi-automatically or automatically by applying paste solder paste consisting of solders, binders, and solders to the board and then attaching the components to the board using manual or automatic mechanical devices. 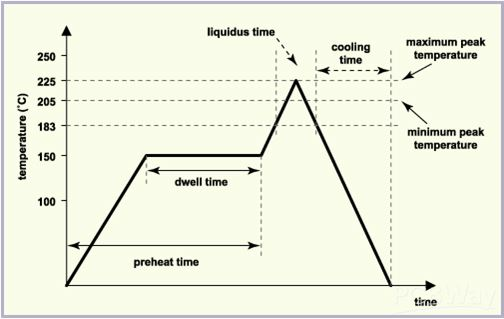 The solder paste is then heated to reflux by means of a heating furnace or hot air, at this time, the heating temperature shall be precisely controlled according to the melting temperature of the solder paste. 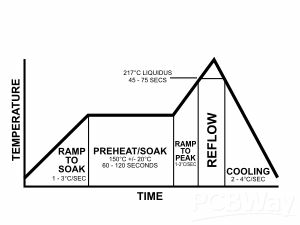 This process includes: preheating zone, reflow zone and cooling zone. After reflow soldering is completed, it is cooled and tested, and finally adjusted and cleaned. Cleaning is to remove residual impurities in the board surface, to avoid corrosion printed circuit board. As can be seen from the above figures, the pores, tin beads, bridge connection, PCB distortion, pseudo soldering and tombstoning phenomena are common defects both in wave soldering and reflow soldering, while wicking and cracks are common in reflow soldering, and icicles and white residues are common in wave soldering. For a certain kind of defect, there are many reasons for its production. Any incorrect parameter setting in the process or wrong property selection of material may lead to the defects. Therefore, in the actual production, we cannot ignore any link. On the one hand, we should strictly control every operation in the process, and on the other hand, we should analyze the specific problems case by case, so as to optimize the process and eliminate defects.